Go to the Import tab and click on the Documents icon, the first on the left. A dialog window appears, in which you can select the files to be imported. Press Ctrl (Windows) or cmd (Mac) to select multiple files at the same time. After making your selection, the files are inserted into the open MAXQDA project and displayed in the “Document System” window. The following image shows that seven texts (“Kim”, “George”, etc.) have been added. By default, all inserted texts, PDF documents, tables and images are saved in the project file. This means that you can modify or delete the source file with no effect on the file in the project. Conversely, if you make changes to a file in MAXQDA, e.g. improving typing errors, without changing the source file. Exceptions are audio and video files, they are not stored in the project because of their size but in a special folder for external files. The same applies to PDF documents and images that exceed an adjustable file size. For more information, see “External Files”. When inserted, MAXQDA takes the filename as a document name, it can be modified later, avoiding duplication. Depending on the type of document, the documents are given different symbols. Note: Using the other icons on the tab, special data types, such as focus group transcripts, survey data, or data from Twitter can be imported. The specifics of these imports are described in detail in their own sections. Once you’ve imported your documents you’re ready to start your analysis. Most people don’t start with the analysis immediately, though, and prefer to organize the documents in folders, as they might do on their computer’s hard drive. Rather than using folders, MAXQDA uses document groups. They work just like folders do on your computer – you can name them and drag documents into them. Click the New Document Group icon in the “Document System” toolbar. Right-click on the root folder in the “Document System“ and select New Document Group from the context menu. 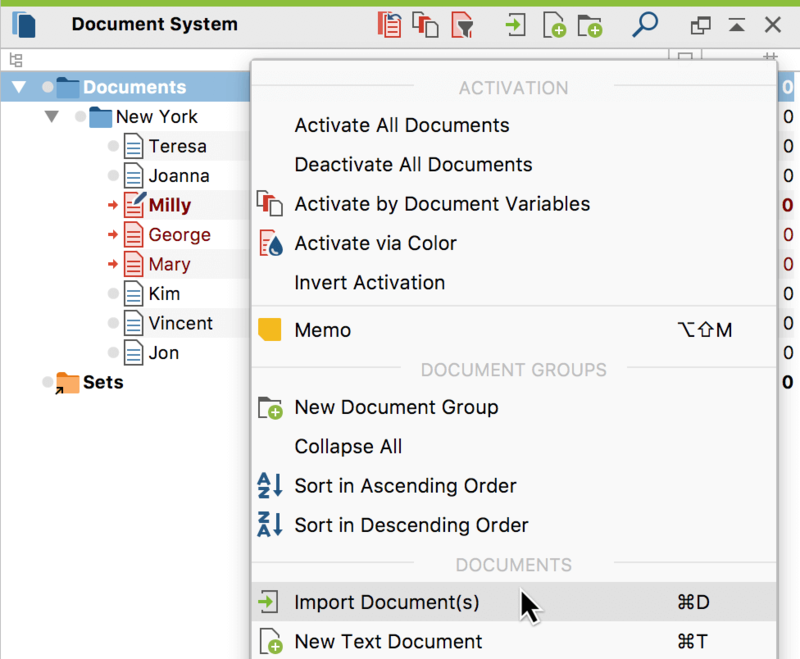 MAXQDA then creates a new document group at the top of the “Document System” and automatically assigns a name and number. To give the document group a meaningful name, click on it with the right mouse button and select Rename. Alternatively, click the name once with the mouse button to select the line, and then click the name again. Suitable names for document groups are e.g. the data types (individual interviews, group discussions, document analyses, etc.) or differentiation criteria resulting from the sampling (first survey wave, second survey wave, ecclesiastical organizations, public-law organizations, etc.). Please note: Document groups can only be created at the top level. You can’t create a document group within a document group. The assignment of documents to document groups can be changed at any time by clicking on the document symbol in the “Document System” with the mouse and, holding down the left mouse button, moving it to where you want to assign the document. You do not have to specify the document group to which it is to be assigned when importing the document. You can arrange the order of the documents in the “Document System”. Just click and drag the document to the desired position. You can select multiple separate documents by holding down the Alt key (Windows) or option key ⌥ (Mac) and then move this selection while holding down the mouse button. To select a range of documents, first click on one document and then click on a second document while holding down the Shift key ⇧. This then selects all the documents between these clicked documents. To move multiple documents at once, first activate these documents by, for example, holding down the Ctrl key (Windows) or the cmd key (Mac) and then clicking on them. Now click on a document group with the right mouse button and select Move Activated Documents Here. To sort the documents of a document group, choose Sort in Ascending Order from the context menu of the document group. MAXQDA sorts the documents in ascending alphabetical order according to their names. To sort the documents in descending order from Z – A, select Sort in Descending Order. 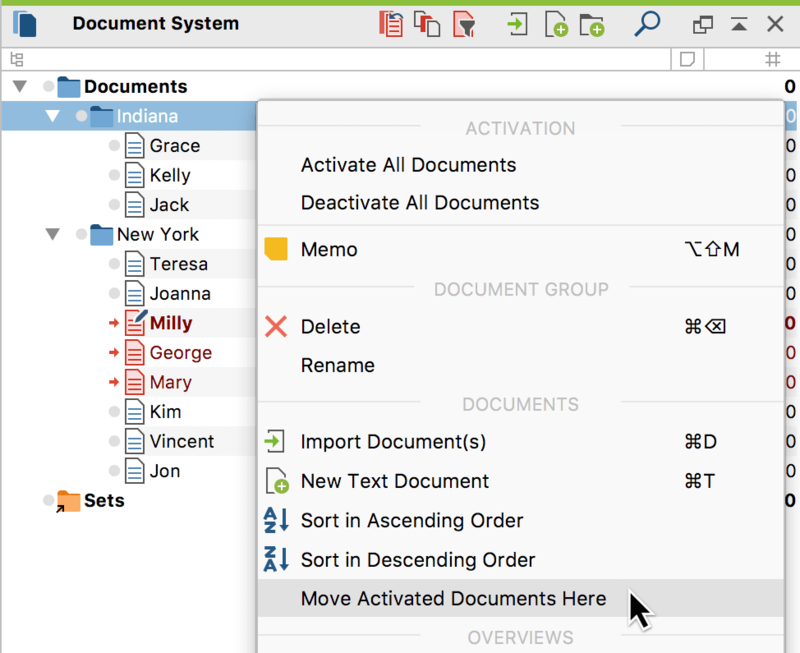 To sort document groups by their names, right-click on the root folder of the documents, and choose Sort in Ascending Order to sort them from A – Z or Sort in Descending Order for the reverse order. Please note: You will often be working with documents or document groups whose names consist of numbers or whose names contain numbers, e.g. Interview 1, Interview 2, Interview 3. In the case of more than ten documents or document groups, it is recommended to use double-digit numbers for their description, so that the documents are sorted according to the order of numbers, e.g. Interview01, Interview02, …, Interview48. In the case of more than 100 documents or document groups, corresponding three-digit designations should be used, e.g. Interview001, Interview002 etc. Click the Import Documents icon on the toolbar of the “Document System”. Or use the keyboard shortcut Ctrl+D (Windows) or cmd+D (Mac). Or click on the root folder in the “Document System” with the right mouse button and select Import Documents. Or, right-click the document group to which the document is to be assigned. From the context menu, choose Import Documents. As described above, a dialog window opens in which you can select which file to import. Please note: The imported documents are imported into the selected document group, i.e. marked in blue. If no document group or root folder is selected in the “Document System”, MAXQDA inserts the new documents at the top of the document “tree”. Files can be imported from the hard disk via drag and drop: Select one or several documents in the Windows Explorer or Mac Finder and simply drag the documents into the “Document System” with the mouse. Then drop the documents in the desired position. Tip: To import the documents of a whole folder into MAXQDA, drag the folder from the Windows Explorer or Mac Finder to the “Documents System”. MAXQDA then creates a new document group with the same name of the file folder at the top of the document “tree” and imports all documents that MAXQDA can import. If the folder contains subfolders, these are also created as separate document groups. MAXQDA makes it possible for you to create and save a temporary grouping of documents. While each document can only be in one document group, it can be in as many document sets as you wish, because document sets are only made up of shortcuts to the documents. In other words, a document set can be deleted without it having any effect on the document. If that same document were deleted from a document group, however, it would be deleted from the project along with all of its memos, coded segments, links, etc. Document sets are created via activation. You can activate a document by right-clicking on it and selecting Activate from the context menu. You can see that a document has been activated, because it turns red and a red arrow appears just to the left of the document symbol. Tip: For quick, easy activation, left-click on the grey circle next to the document symbol. In this way, you can also activate an entire document group. Right-click on the word Sets at the bottom of the “Document System”. MAXQDA then creates a new set with the name “Set 1” and adds all activated documents to this set. You can click on the name with the right mouse button and choose another that is more appropriate. Document sets are manipulated like document groups; you can activate all the documents in a document set at the same time and use all the options for working with document groups (Codes, Memos, Variables, Links, etc.). Individual documents can be deleted from a document set: Right-click on a set and select Remove document from set. Or drag and drop documents to move them from set to set. Tip: You can drag a document into a set at any time. Drop the document into the desired set and MAXQDA will insert it directly at the top of the set. Document sets are very practical when you want to analyze a certain selection of documents. Forming a document set is also an easy way to save the result of a complex variable activation process. Each document contains a data record of variables (“document variables”). When you import a document, a record is simultaneously generated – much like during your first visit to a new doctor. If at the time of import a data record containing variables is generated, firstly only certain internal MAXQDA variables will be saved. To view these internal variables (“System Fields”), click Overview of Variables in the context menu of the document. Here, you can see the date, time, and user name (author), among other information. In the Number of Coded Segments and Number of Memos columns, MAXQDA will display the existing coded segments and memos for this document. This information will appear as a tooltip if you hover the mouse over a document name in the “Document System” window and wait a moment.